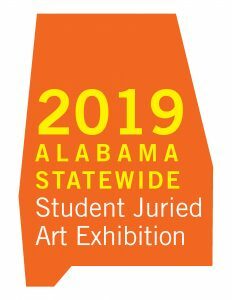 Open to all Alabama high school students in grades 10-12 for the 2018-19 academic year. Work must have been completed in the past 2 years. Entry is limited to 2 works per student. For each work you may submit up to 2 digital images (a general view & a detailed view). JPG images must be attached to your application email. DO NOT zip orsave JPGs as a PDF; DO NOT use cloud-based file sharing services. Digital images should be sent as JPGs, 72dpi, measure 1200 pixels on the longest side, and saved at “high” quality. first name, followed by (underscore) entry number. DO NOT include any other information in the file name, such as title of work, etc. Accepted works must be delivered ready-to-install. Matting/framingis not required for 2D works, but all artwork should be presented in a professional manner. For image formatting or presentation questions, email SCAC Executive Director Bruce Andrews: bruce@shelbycountyartscouncil.com. All entries must follow the above guidelines or will not be accepted. All possible care will be taken in handling artwork. Shelby County Arts Council and/or any of its partnering organizations cannot be held responsible for loss or damage. Artwork will be stored for 30 days after the close of the exhibit. Any artwork remaining after 30 days will be discarded.